DON'T BE FOOLED BY CHEAP IMITATIONS! Most Hemp oil supplements offer weak formulas with synthetic fillers or with ordinary coconut oil! 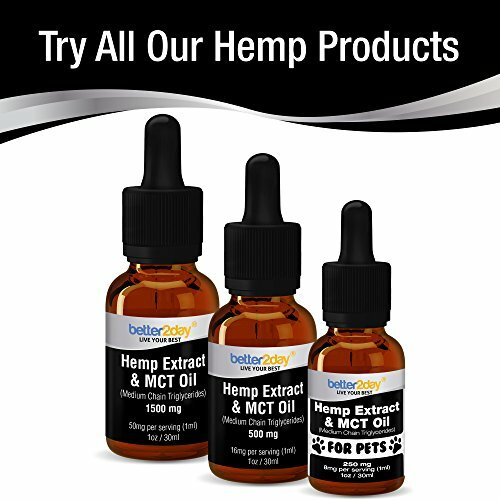 With Better2Day Hemp Extract + MCT Oil for Pets you are guaranteed the highest quality of hemp homegrown in Colorado, USA for the best absorption and maximum bioavailability your cat or dog deserves! 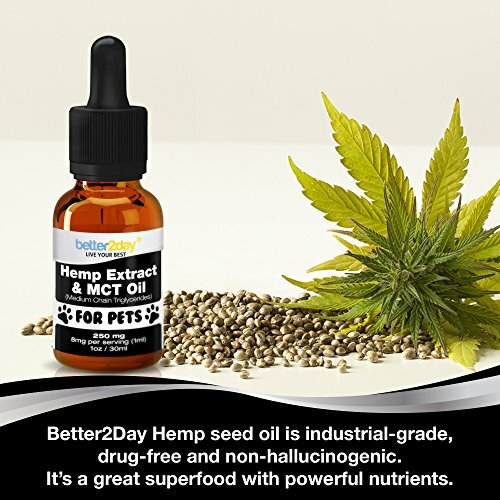 HEMP EXTRACT VS HEMP SEED OIL - You can buy hemp seeds and hemp seed oil in stores, but it is not the same as "hemp extract". Hemp extract is derived from the entire hemp plant - leaves, stalks and flowers and contains more nutrients, including a wealth of phytonutrients and healthy fats. 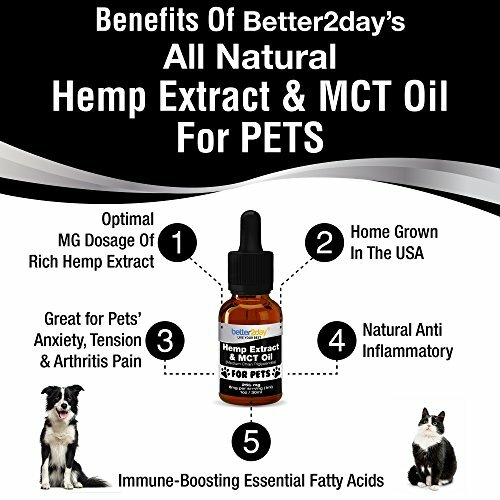 Great for pets with pain, arthritis, anxiety, skin issues, cognitive dysfunction. MADE IN USA & ALLERGY FREE - Legal in all 50 states. This non-psychotropic blend is Free Of Soy, Milk, Egg, Shellfish, Corn, Wheat & Peanuts. Contains NO Gluten, Fillers, Binders, Or Preservatives. Manufactured Under The Highest U.S Quality Regulations and Standards. Free Of Contamination, Molds And Toxins. 100% HAPPINESS GUARANTEED. 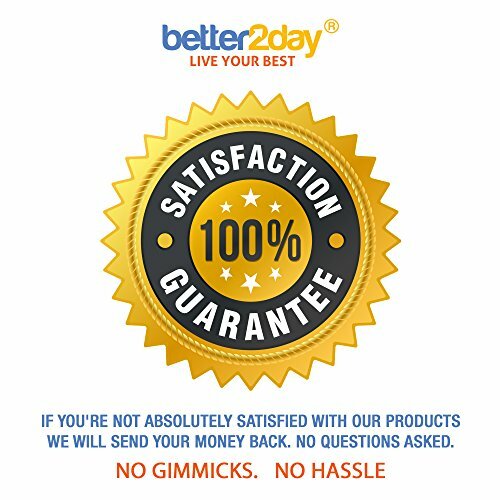 If you don't absolutely LOVE this Better2Day product... For ANY reason whatsoever, simply send us a message and we will be happy to offer you a fast, prompt refund. DON'T BE FOOLED BY CHEAP IMITATIONS! Most Hemp oil supplements offer weak formulas with synthetic fillers or with ordinary coconut oil! 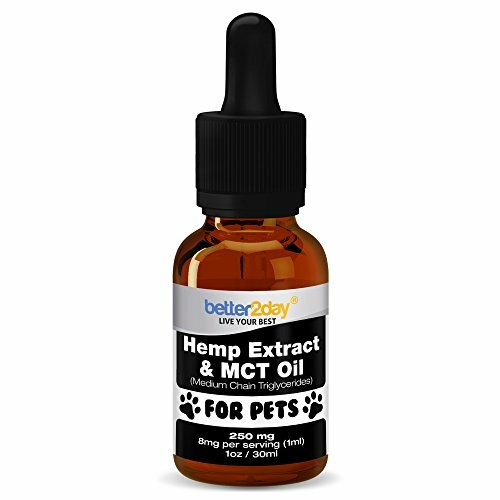 With Better2Day Hemp Extract + MCT Oil for Pets you are guaranteed the highest quality of hemp homegrown in Colorado, USA for the best absorption and maximum bioavailability your cat or dog deserves! 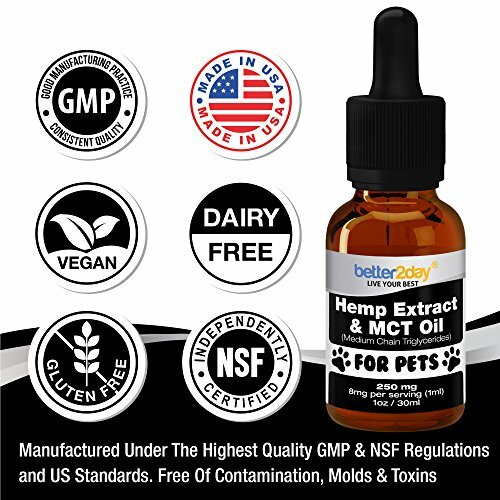 Although there has been very few research on the effects of hemp on pets, there are a lot of anecdotal reports on various forums and platforms on the Internet, that attest to positive effects. And more. Please check your vet for full benefits. With Added Benefits of MCT Oil- Medium Chain Triglycerides (MCT) is typically extracted from coconut or palm oil, which are both rich natural sources. 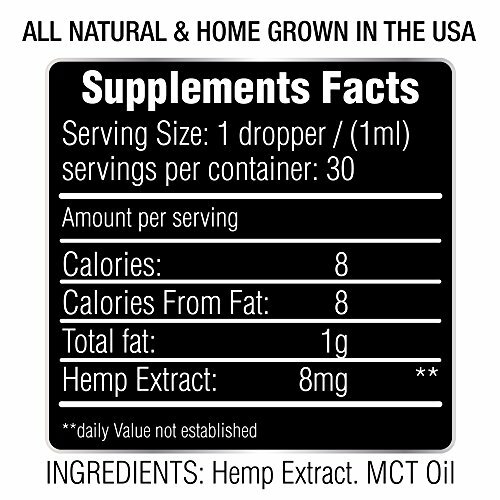 MCT supports hormones, gut health, immune health, better brain and memory function, and is a good source of energy. Directions: For pets under 25 lbs use 0.6ml (approx. 20 drops). 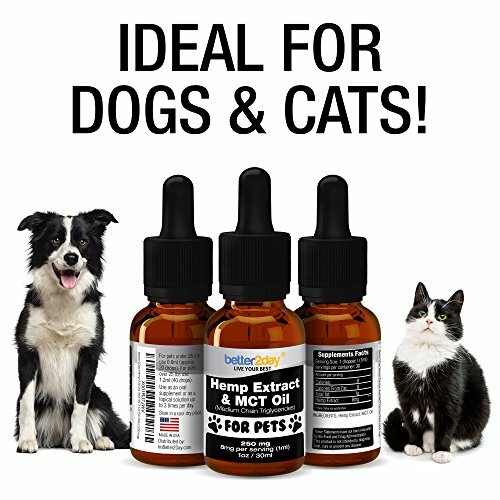 For pets over 25 lbs use 1.2ml (40 drops). Use as an oral supplement or as a topical solution up to 3 times per day.